Want to replace your outdated drop ceiling with a sleek and modern alternative? Tin ceilings are expensive, but you can get the same high-end look by using some inexpensive materials. Sometimes, adding a drywall ceiling in place of a drop ceilling isn't an option, and replacing it can be time consuming. 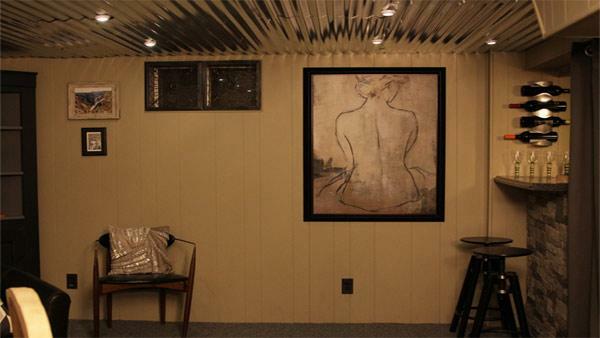 Instead, we gave this basement the industrial feel of a tin ceiling for less money by using corrugated metal panels. 1. Measure your ceiling and purchase your panels accordingly. You can get them at most home improvement stores for between $10-18 each. They typically come in 4x8 foot sheets. 2. Attach your metal panels using metal screws and make sure to attach into the old drop ceiling's metal framework. We used self-drilling metal sheet screws, which makes pre-drilling the holes unneccessary. 3. If you need to cut the panels, use a metal grinder to make them the right size. 4. If you have ceiling lighting, use a metal grinder or metal snips to cut the openings you need. We used inexpensive LED lights for this project to give the room a sophsticated feel.